After dropping my son off on a Friday morning for archery practice at the Sharjah Wanderers Golf club, I often spend the few hours before I have to pick him up again doing a spot of twitching and trying to get some decent bird pictures. I often see a variety of wildlife around the golf club including lizards and snakes; I once stopped the traffic to allow a snake to cross the road. Today I decided to try and get some photos of Red-wattled Lapwing chicks, as they are just starting to hatch. These birds nest everywhere and anywhere, just placing a few twigs on the ground, often next to heavy human activity (under the swing in the Sharjah Colleges Nursery school outside play area for example). They are also very common on the wide grass verges next to the road, so that is where I decided to look, slowly cruising down the road between the golf club and the Sheikh's Palace, when suddenly I saw a fox, on the far edge of the grass verge, next to the Damas trees. 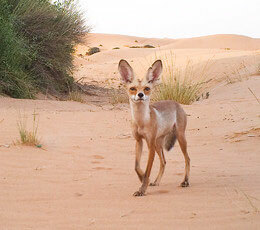 At first I thought it was a Ruppell's Fox, but now I think it was an Arabian Red Fox. I had my camera with me, but I was almost opposite the entrance to the Sheikh's Palace and I've been warned before and told to move on when taking bird pictures there. So the fox and I just stared at each other for 30 seconds or so. I then realised that we were both there for the same reason Red-wattled Lapwing eggs and chicks. I hope it had more luck than me. It is perfect time to make a few plans for the longer term and it's time to be happy. I have read this publish and if I may I desire to counsel you some attention-grabbing issues or tips. Perhaps you can write subsequent articles regarding this article. I want to learn more issues about it! You really make it seem so easy with your presentation but I find this topic to be actually something that I think I would never understand. It seems too complex and extremely broad for me. I'm looking forward for your next post, I'll try to get the hang of it! Thanks for some other fantastic post. Where else may anyone get that type of information in such a perfect means of writing? I have a presentation next week, and I'm on the look for such info. Great goods from you, man. I have understand your stuff previous to and you're just extremely magnificent. I actually like what you have acquired here, really like what you are saying and the way in which you say it. You make it entertaining and you still care for to keep it wise. I cant wait to read far more from you. This is actually a tremendous web site. Outstanding post however , I was wondering if you could write a litte more on this topic? I'd be very thankful if you could elaborate a little bit further. Appreciate it! It's a shame you don't have a donate button! I'd without a doubt donate to this outstanding blog! I guess for now i'll settle for bookmarking and adding your RSS feed to my Google account. I look forward to brand new updates and will talk about this website with my Facebook group. Talk soon!